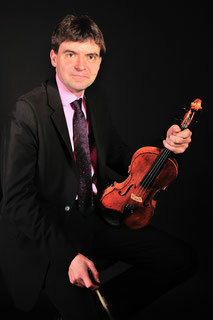 My name is Volker Reinhold, I am the concertmaster of the Mecklenburg State Orchestra which performs operas, operettas, musicals, ballet and concerts at the Mecklenburg State Theater in Schwerin. last but not least playing small and big violin solos of which there are a lot! All of that is already a fulfilling task. However in order to achieve musical development and progress one needs room from which to draw the necessary freshness and sovereignty for future challenges in the orchestra. My biggest achievement is the virtuosic violin literature of mainly Pablo de Sarasate and Fritz Kreisler, but also Paganini, Bazzini, Wieniawksi, Vieuxtemps and others. Together with my piano partner Ralph Zedler I was able to establish a huge repertoire over the last 10 years. In 2013 we set ourselves an ambitious goal: Recording six of Sarasates 13 opera phantasies. Besides the well-known Carmen phantasy these pieces include true rarities and real jewels. Who for example knows the phantasies over “Der Freischütz” by Carl Maria von Weber or “Romeo and Juliet” by Charles Gounod? It suggested itself that a concert master of an opera orchestra plays adaptations of operas which he has performed from the orchestra pit over the last years. For that purpose I could convince the renowned label “MDG Musikproduktion Dabringhaus und Grimm” from Detmold. Having completed the second volume all opera phanties of the great virtuoso from Pamplona are now united on two SACD´s from the label MDG Musikproduktion Dabringhaus und Grimm.